Let’s not forget that video email is like normal email in that the objective is to drive the viewer to take an action; click to buy, tap to watch more, etc. Your video might already include a clear call-to-action, like this one below, in which case you can simply upload it to Playable and embed it into your email campaign. Send yourself a this Bladerunner video email showing how a compelling call-to-action in conjunction with engaging video content drives response. If your video doesn’t include a clear call-to-action, no worries, because Playable provides all the tools you need to incorporate your call-to-action within your video; Endcard, Footer, Captions, Watermark, and Looping. Send yourself a video email showing how an endcard with a strong call to action works in conjunction with the video content to drive response. Send yourself a video email showing how a footer works in conjunction with video content to drive response. Send yourself a video email showing how captions in conjunction with video drives response. Overlay a transparent play icon to signal that the video needs to be clicked – this is effective where the call-to-action is to watch a longer version of the video – e.g. a full movie trailer. The Dark Knight example above also includes a Watermark. The latest release of the Playable platform includes the option to switch video looping on or off. We have found that for some types of video, engagement can be increased by switching looping off, so that viewers sees 6 to 10 seconds of video, then playback stops at an endcard showing a clear call to action, in a similar fashion to the approach used in Direct Response TV commercials. Now that call-to-action is taken care of, what else is needed to maximise the response to your video email campaign? 2. Video resolution and frame rate. Quality of the video within the email is critical to delivering high engagment at the moment of opening the email. Your video email audience doesn’t care about the format of the video. Playable delivers a mix of MP4/H.264, GIF, PNG, WEBP, and other formats. Your video email audience expects a high quality video experience where the resolution is good for the device they are using, and the frame rate is high. The human eye is capable of differentiating between 10 and 12 still images per second before it starts perceiving motion. That is, at a frames-per-second (FPS) of 12 or less, your brain can perceive that its just a bunch of still images in rapid succession, not a seamless animation. Playable detects the device and screen density of each viewer, and adjusts the video to best suit. We also look at the network connection. So someone watching a video email at home on a MacBook connected via wifi will get a different version to someone watching on a Samsung phone connected over a cellular network. Over 70% of videos delivered by Playable are at a frame rate of 12 fps or more. Over 90% are at a frame rate of 10 fps or more. Autoplay video is essential for high engagement video email. The old method of showing a static thumbnail – perhaps with a playhead watermark added – that opens a web browser to display a page including a video, is simply not good enough, because less than 5% of your audience will actually get to watch and enjoy that video. Similarly, the method of simply embedding an HTML video – requiring the viewer to tap to play – is not good enough, because only a small fraction of your audience will get to watch the video. Instead, Playable achieves autoplay on over 95% of inboxes. According to Playable data, the optimal duration for video email to deliver engagement and drive response is between 6 and 10 seconds. 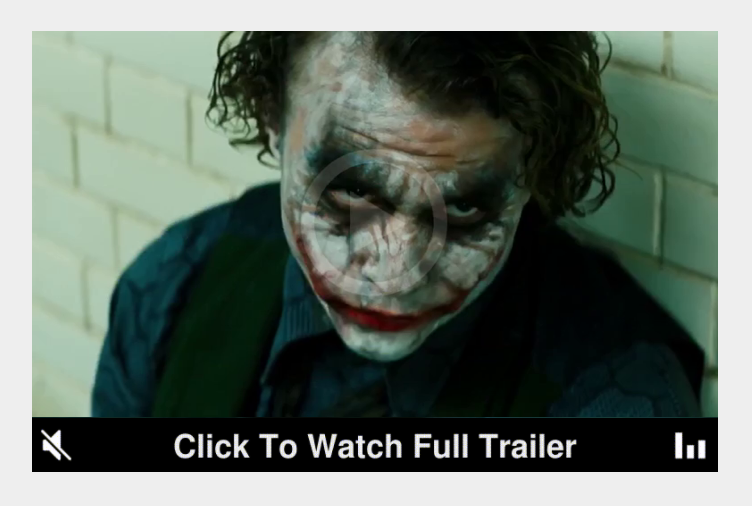 This is in synch with the duration of Google Youtube previews, and Vine and Instagram videos. It’s a universal constant of human attention. Autoplay with sound in video email is too jarring an experience for users, and the viewer has a clear preference for content that starts playing muted. This preference follows the approach used in the Facebook News Feed. When viewers wants to lean in and engage further, a click or a tap can take them to a web browser playing the video with sound, or Playable also offers options to link to a video with sound that plays within the inbox.